The style of this class is Kripalu which means compassion. This style of yoga is about building compassion towards ourselves so that it can beam outward towards other people. We practice compassion by focusing our attention inward and honoring our body’s messages without judgment. This gentle yoga practice will include a warm-up and a series of postures designed to quiet the mind, relax the body and open the heart. 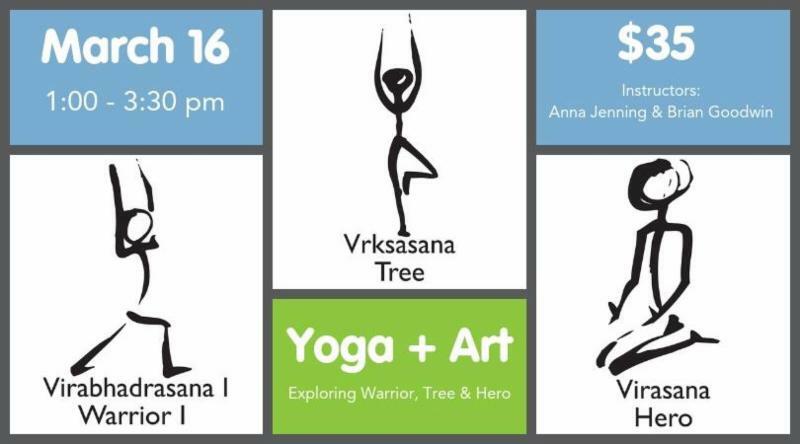 This practice will highlight the following postures: Warrior (strength, courage, perseverance…. ), Tree (rooting, grounding, centering…. ), and Hero (honor, transcendence…. ). Creative expression allows one to practice a similar sense of non judgment and facilitates developing more self understanding. The more we trust the process, the more we know. Offering further exploration of Warrior, Tree and Hero, we move to a period of journaling/sketching. These pages and other blank ones will then be sewn together to create a journal, ready to take home for further personal expression and reflection. Use natural materials stretchable, strong, and radiant, representative of today’s poses: beeswax, cotton, leather, wood, copper, glass. Options include binding the journal, decorating the cover, and making a page marker. All supplies provided.